2. Keep tests out of the reach of children or pets. Do not ingest anything from this test kit. Do not drink water sample used for testing. Store and use at room temperature (15-30°C / 60-86°F). 4. Read and follow all instructions carefully. Use a fresh water sample for each test. 1. Take out the Bacteria Test vial and set it upright on a flat surface. 5. Place the capped vial upright in a warm area (21-32°C / 70-90°F) where it cannot be disturbed for 48 hrs. Purple Colour: Negative Result (No bacteria were detected). Yellow Colour: Positive Result (It is highly likely that potentially harmful bacteria were detected). 4. Place both test strips into the test vial, with arrows pointing DOWN. Do not disturb or move vial once the test strip has been placed inside it. 1. Carefully open Nitrate / Nitrite Test packet and take out test strip. 2. 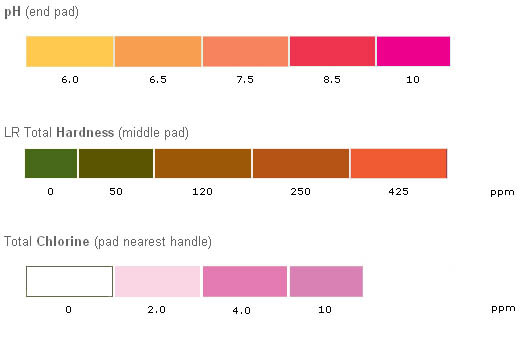 Immerse the reagent pads into water sample for 2 seconds, remove, after 1 minute match colours with the chart below. 3. Colours are stable for 1 minute. 3. Match pH, Total Hardness and Total Chlorine pads (in that order) to the colour chart. Please note that Watersafe® is a screening test and can not be used to certify water as safe or unsafe for drinking. Watersafe® provides approximate results ONLY when used in strict accordance with instructions. Simplexhealth expressly disclaims any liability resulting from the use of this product, failure to follow instructions, or reliance on test results.